The program airs weeknights at 11:35 p.m. ET/PT. The show opens with Fallon's topical monologue, then transitions into comedic sketches/games, concluding with guest interviews and musical performance. The Tonight Show Starring Jimmy Fallon attracted high ratings from its 2014 premiere. Many moments from the series have generated viral videos. The show has been nominated for nine Primetime Emmy Awards, winning two. On August 13, 2015, NBC announced that Fallon signed a contract to remain as host until at least 2021. The Tonight Show premiered on NBC in 1954 as Tonight, hosted by Steve Allen. Jack Paar hosted the show from 1957 to 1962, but the show's longest-running and most famous host was Johnny Carson, who hosted the show for three decades and received six Emmys. Following Carson's 1992 retirement, "vast quantities of brainpower, money, and column inches were devoted to the issue of who was truly best suited to carry the franchise forward." NBC chose interim guest host Jay Leno, who took over the show that year. A pair of conflicts ensued over Leno's 22-year tenure, both revolving around the then-current hosts of Late Night, the program directly following Tonight since its premiere in 1982. Original Late Night host David Letterman was considered Carson's top choice as successor and left the network acrimoniously in 1993 after Leno was given the job. Years later, NBC attempted to transit Letterman's Late Night successor, Conan O'Brien to in turn succeed Leno as host of Tonight in 2009. However, as a result of various contractual obligations and fears of losing performers to other networks, Leno was given a nightly prime-time show shortly after Conan's run began. Leno posted less than stellar ratings, leading to a domino effect on the late local news. O'Brien's Tonight also suffered falling ratings leading to a public controversy that resulted in O'Brien leaving the network the following year, and Leno returning to host The Tonight Show. Jimmy Fallon, a former cast member from 1998-2004 on Saturday Night Live , was appointed as the third host of Late Night by executive producer Lorne Michaels in 2009 when O'Brien moved to Tonight (only for a little over a year), Fallon incorporated the Internet much more than other talk shows. Between Fallon's own musical sensibilities and the recruitment of his house band, hip-hop collective The Roots, his incarnation of Late Night "evolved into the most deeply musical of TV's musical-comedy variety programs", with sketches in which he parodies Neil Young and Bruce Springsteen going viral online. Coincidentally, it was during the 2010 Tonight controversy that Fallon's show found its footing. The show, according to Fallon's former SNL castmate Tina Fey, established itself as "an uncommonly warm, welcoming show." In 2010, New York complimented Fallon's "good humor" and noted his improvement: "In the relative safety of his 12:35 a.m. time slot, Fallon has been cultivating a distinct, and refreshing, strain of humor: the comedy of unabashed celebration." "In our heads, we've been doing The Tonight Show […] We're just on at a later hour," Fallon said. Fallon, who dropped out of college at the College of Saint Rose a semester shy of a degree to pursue comedy, grew up with no designs on the Tonight job (unlike O'Brien or Leno), most likely because he was just 17 years old and still in college, when Carson retired. Discussions for Fallon to take over The Tonight Show began in early 2013, with the transition intended to happen by late 2014 at the latest. Many industry observers noted that the change appeared to come as a result of another late-night competitor, Jimmy Kimmel (24 years old at the time of Carson's retirement) of Jimmy Kimmel Live! on ABC, who moved to the 11:35 slot months prior; NBC feared that by waiting too long to promote Fallon, Kimmel could create a stranglehold on young demographics, which is key to the financial success of the franchise. Fallon had reportedly impressed top executives at Comcast (which had recently completed a full takeover of NBCUniversal), and his succession was widely expected throughout the company. The transition reportedly lacked the tension of previous Tonight transitions, and the program's relocation east "signals NBC's strong commitment to not messing with the program any further." On April 3, 2013, NBC announced that Jay Leno would retire in 2014, with Fallon taking over The Tonight Show beginning on February 24, 2014. At Leno's suggestion, the date was moved forward from the end of his contract in September 2014, to February so as to use NBC's coverage of the 2014 Winter Olympics as a springboard for Fallon's tenure. The date was later moved up a week to February 17, midway through the Olympics. As Leno's contract ran until September 2014, much of his staff were paid until that month. By bringing over many of his recurring bits and features from Late Night, Fallon has departed in a few ways from the format which Leno used for his show. Fallon's edition places less emphasis on his opening monologue, a feature which was a staple of the Leno edition. In his opening episode, in which he described what the format of the show would be, he only briefly mentioned the monologue. The show has many recurring segments and games that are played with the various celebrity guests. The most popular of these, "Lip Sync Battle", was spun off into its own show that premiered on Spike (later re-branded as Paramount Network) after being passed on by NBC. Similarly, "Wheel of Musical Impressions", another popular segment spawned That’s My Jam, a music and variety game show set to debut with a 10-episode order during the 2019-20 television season on NBC. Other segments include playing charades, Catchphrase, Pictionary, or other family style games. Additionally, Fallon and celebrity guests regularly appear in sketches parodying pop culture or political events. These segments normally take place after the monologue, but have occurred as a cold open for the show on a few occasions. Just as he portrayed Mitt Romney during the 2012 election season, Fallon portrayed Republican candidate Donald Trump and Democratic candidate Bernie Sanders. Alongside Fallon's impressions, other celebrities occasionally appear. Several have recurring roles, including Dion Flynn as Barack Obama, David Alan Grier as Ben Carson, Aziz Ansari as Bobby Jindal, the show's announcer Steve Higgins as Jeb Bush, and the show's head writer AD Miles as Lindsey Graham. After his critically acclaimed appearances as Trump on Tonight, Fallon was asked to play the role on the December 19, 2015 episode of Saturday Night Live, since Taran Killam (who had been announced as the season's Trump) would be busy playing Ted Cruz. Fallon accepted the offer, but the plan fell through at some point before the show. The role was filled by Darrell Hammond, who played Trump over his fourteen years on SNL. Fallon has also appeared as figures such as Donald Trump, Vladimir Putin and Bob Dylan. 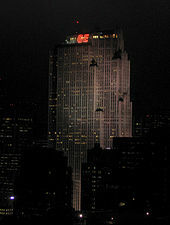 The show originates from the Comcast Building, pictured in 2005 when it was the GE Building, at 30 Rockefeller Plaza in New York City. The Tonight Show Starring Jimmy Fallon originates from NBC Studio 6-B at 30 Rockefeller Plaza in New York City, the original home of The Tonight Show Starring Johnny Carson, where it is taped every weekday at 5pm. The studio housed both Carson and his predecessor, Jack Paar, before the franchise's move to Burbank in 1972. "It is where The Tonight Show started -- actually in the studio where we are going to be, that's where Johnny Carson was, there's Broadway, there's Times Square, there's something glamorous about it. That is The Tonight Show," Fallon remarked. NBC spent approximately $5 million renovating Studio 6-B, where Fallon had been taping Late Night, for The Tonight Show's return to New York City. The upgraded 6-B contains improved acoustics and a seating capacity of around 240, up from 189, but smaller than the seating capacity of The Late Late Show. The investment also included a new control room and a new lobby to welcome guests. The larger audience also meant NBC could take advantage of a newly enacted New York state tax credit for talk shows that are "filmed before a studio audience of at least 200, as long as they carry a production budget of at least $30 million and have been shot outside New York for at least five seasons." Fallon's Late Night successor, Seth Meyers, is housed directly above his studio in Studio 8-G; the combination created logistical challenges for executives, who were concerned about "sound bleed" (as the building was built with steel girders, sound is too easily conducted floor to floor). As a result, The Tonight Show tapes at 5:00pm, and Meyers' show tapes later in the evening, at 6:30pm. Additionally, because of The Roots' still active tour schedule, The Tonight Show tapes two shows on Thursday at New York, one for Thursday night's airing, and one for Friday night's airing. However, the show still tapes daily Monday through Wednesday throughout the week. Occasionally, they will tape a show on Friday for Friday night's show, but it is more common that they will tape two shows on Thursday. The show's set was designed by theatrical set designer Eugene Lee, known for his credits on Saturday Night Live, whom Fallon thanked on-air on his first episode. The set "emphasizes stained wood and a mid-century modern style," including "a slate blue couch, a handsome honey-colored wood desk and matching walls." Behind the desk near the city backdrop is a wood-carved miniature replica of New York City skyscrapers. "I think it's Eugene Lee's masterpiece," said producer Michaels. Fallon's monologue spot is noted by a painted four-leaf clover on the floor. "Fallon's new set is purposefully old-fashioned compared to the college-cafe-in-the-meatpacking-district where he lived on Late Night," said Entertainment Weekly. USA Today called the set more "intimate and theatrical" than the set employed on The Tonight Show with Jay Leno, and The New York Times called it more elegant, "but also quite formal and a little impersonal." The show's logo, its title set against a full moon, is a callback to The Honeymooners, while the title is a throwback to Carson's tenure: Leno and O'Brien both favored a "with," rather than "starring," in their respective titles. In November 2014, a new marquee was added to the Avenue of the Americas entrance of 30 Rock, which promotes the building as the home of The Tonight Show Starring Jimmy Fallon; the new marquee was also designed so that it can be usable as a stage for performances. John Wallace, NBCUniversal's president of technical operations, described the marquee as being a "bold statement" that The Tonight Show had been brought back to New York. Fallon joked that the marquee "makes it exponentially harder for them to fire me", and that he was "jealous of Letterman." The show's opening sequence, directed by filmmaker Spike Lee, features Fallon visiting various New York City landmarks, including Grand Central Terminal and Katz's Delicatessen. Steve Higgins introduces the show with "From Studio 6B in Rockefeller Center, in the heart of New York City, it's The Tonight Show Starring Jimmy Fallon!" and announces that night's guests and "the legendary Roots crew". The show's theme song is "energetic with jazzy overtones" with "Hey Jimmy", designed to match the shots of the city. Just before Higgins introduces Fallon, the camera cuts to a shot of The Roots, and Questlove shouts the numbers symbolizing the episode number of The Tonight Show. Higgins then introduces Fallon with a drawn-out "And now, here's your host/here he is, Jimmy Fallon! ", and Fallon begins his brief monologue. On March 20, 2019, an abbreviated version of the introduction debuted, which begins with a shot of the curtain and Higgins introducing Fallon with “Welcome to The Tonight Show! And here’s your host, Jimmy Fallon!”, with a condensed version of "Hey Jimmy" played by The Roots as he walks out. Prior to composing an entirely new theme song, bandleader Questlove noted to Vanity Fair that they were considering a variation on Late Night's theme, which itself is a sped-up adaptation of The Roots' 2006 song "Here I Come". For their transition to The Tonight Show, The Roots added two horn players from Sharon Jones & The Dap-Kings ("You can't be The Tonight Show without a horn section," said Questlove). As he did on Late Night, Jonathan Cohen supervises the show's musical guest bookings. Following the monologue, the main segments are a mix of interviews and performances—examples of the latter include musical impressions, lip-syncing contests, games of Pictionary and egg Russian roulette. His celebrity interviews are throwbacks to "Merv Griffin-style celebrity gush." Before the first airing of the show, Fallon expressed that it was essentially an extension of his tenure at Late Night, explaining that his Tonight Show would be "the best of the best of what we do". The show has carried over some of Late Night's well-known performance bits, such as "Egg Russian Roulette", a game in which Fallon challenges guests to pick random eggs and then smash them against their forehead to see whether the eggs are raw or hard-boiled. Each week, Fallon has carried over a popular sketch from his Late Night days: the absurdist "Thank You Notes" segment, in which "he dutifully composes notes of gratitude to abstract concepts and inanimate objects." Another recurring segment, "Tonight Show Superlatives", features Fallon presenting yearbook-style superlatives relating to athletes (particularly, NFL players from the teams being featured that week on Sunday Night Football, or NHL players during the Stanley Cup playoffs). While the vast majority of episodes are produced at the show's New York home base, Fallon's Tonight Show has gone on the road to produce episodes remotely in its first year, spending four nights at Universal Orlando Resort in Florida in June 2014 to promote new attractions at NBCUniversal's theme parks there., Four nights of shows from Universal Studios Hollywood in Los Angeles aired February 2015, in the days immediately following a special Sunday night show from Phoenix, Arizona airing after NBC's coverage of Super Bowl XLIX on February 1, using the Stage One facility previously utilized for Conan O'Brien's Tonight Show run, and also E! 's Chelsea Lately until its August 2014 end. The L.A. shows brought Tonight back to the locale where it had been based since Johnny Carson relocated the program from New York in 1972 until the start of Fallon's tenure, and echoes Carson himself hosting special broadcasts from the L.A. region prior to the relocation. Fallon hosted The Tonight Show again from Universal Orlando Resort, April 3–6, 2017, in anticipation of the opening of Race Through New York Starring Jimmy Fallon, a motion simulator attraction based on his tenure at the show. Fallon once again aired a special episode after Super Bowl LII, from Minneapolis' Orpheum Theatre. A special episode of The Tonight Show was broadcast on January 15, 2019, filmed in Puerto Rico, rather than a typical remote broadcast, in which Fallon described it as a "love letter" to Puerto Rico, which was severely hit by Hurricane Maria in September 2017. The episode included guests Lin-Manuel Miranda and Chef José Andrés, a musical performance of "The Story of Tonight" with Miranda reprising the role of Alexander Hamilton alongside Fallon in the same role and the company of the third national tour of Hamilton, Bad Bunny performing "Mia" in the streets of the Old San Juan, and José Feliciano performing "En Mi Viejo San Juan" alongside Ozuna in the gardens of La Fortaleza. The episode also included a segment where Fallon and Tariq Trotter took on the second-longest zip-line in the world and a tour and food tasting nearby Piñones State Forest with Chef José Andrés. Miranda reprised the role of Alexander Hamilton exclusively for the three-week Puerto Rico engagement of Hamilton's third US tour at the Luis A. Ferré Performing Arts Center before the company continues their tour in the United States. In the show's debut episode, Fallon introduced his supporting stars and gave a brief history of his life and career, following it up with a sketch, "The Evolution of Hip-Hop Dancing", with actor Will Smith and a musical performance by U2 at the Top of the Rock. Following the show's premiere, many notable episodes of the show have produced segments that went viral on sites like Facebook and YouTube. Among the show's most popular bits are lip sync battles; one featuring actress Emma Stone aired in April 2014 is the most highly watched online video of the program. In October 2014, actor Daniel Radcliffe recited rapper Blackalicious' "Alphabet Aerobics", which became a popular viral video. Other clips, including the Wheel of Musical Impressions with singers Ariana Grande and Christina Aguilera have been widely viewed, as has a clip of Fallon and comedian Kevin Hart riding the Hollywood Rip Ride Rockit roller coaster during the show's first remote broadcast at Universal Studios Florida. Sketches that reunite casts of television shows, such as Saved By the Bell, in addition to a cappella versions of popular songs performed by Fallon and the Roots, have also been popular. The show's most widely circulated interview segment was one aired in January 2015 with actress Nicole Kidman, who jokingly revealed that she once had a crush on Fallon, to which at the time he was oblivious. On February 1, 2015, the showed aired, to date, its only live show from the Orpheum Theatre in Phoenix, Arizona as a lead-out program from NBC's broadcast of Super Bowl XLIX. The show included an appearance by Arnold Schwarzenegger, a lip-sync battle with Kevin Hart and Will Ferrell, appearances by Super Bowl Champion New England Patriots players, and a performance by Ariana Grande. In September 2016, Fallon faced criticism after an interview with the Republican presidential candidate Donald Trump. Critics accused Fallon of humanizing Trump, who had made controversial statements during the presidential campaign. Democratic candidate Hillary Clinton had also appeared on the show prior that year. Fallon responded to the controversy claiming that nobody should have expected him to ask difficult questions since he is never hard on anyone. Fallon acknowledged that the interview was a setback three months after Trump was inaugurated. On February 20, 2019, during that night's episode, the Tonight Show’s YouTube channel reached 20 million subscribers, making it the first late-night talk show to achieve such a milestone. The debut episode received mixed but generally positive reviews. The New York Times's Alessandra Stanley referred to the show's premiere as "more sweet than sassy," calling Fallon "the grateful heir, the eager freshman, the class clown with top grades and a good heart, someone older viewers can embrace without fear of being mocked or overlooked." Tim Goodman of The Hollywood Reporter was positive in his assessment of the evening, but noted the older fanbase used to Leno may not latch on as quickly. "Indeed, Fallon comes across as eager to please almost to a fault, and he treated his Tonight Show launch very much like a guy auditioning to be accepted into homes," said Brian Lowry of Variety, who considered the premiere episode a demonstration in Fallon's strengths and weaknesses. The first season of the show was deemed "wildly successful." Entertainment Weekly summarized the show's inaugural year: "In his first year as host of The Tonight Show, [Fallon] turned the revered late-night franchise into the hottest party in town, a celebrity playpen full of games, music, surprise guests, and good vibes all around." Nevertheless, detractors of the show, such as John Walters of Newsweek, criticized Fallon for his weakness in interviews. Andrés du Bouchet, a writer for Conan, a fellow late-night show, criticized Fallon for creating what he dubbed "Prom King Comedy"—eschewing odder, more clever material for an over-reliance on games and celebrity cameos. Rolling Stone's Rob Sheffield opined that Fallon's effect led the medium to become overly friendly. The debut episode of The Tonight Show Starring Jimmy Fallon averaged a 3.8 rating in adults 18–49 and 11.31 million viewers overall in Nielsen's fast-national estimates. This made it the second-largest audience for The Tonight Show since May 2009, behind Leno's final farewell two weeks earlier and the transition to Conan O'Brien nearly five years prior. The program's first full week averaged 8.490 million viewers, making it the franchise's most-watched week in 20 years. Following its premiere, The Tonight Show Starring Jimmy Fallon has consistently won its timeslot in ratings, routinely beating Late Show with David Letterman and Jimmy Kimmel Live!. Despite this, the ratings for competitors never significantly fell, with Fallon winning due to a surge in younger viewers. In his first year as host, Fallon's Tonight Show improved on ratings delivered by his predecessor Jay Leno. The series' post-Super Bowl episode in 2015 averaged 9.8 million viewers despite its late 12:13 a.m. start time. The following week's shows from Los Angeles maintained its highest ratings since its premiere. The show fell to second place on the debut night of The Late Show with Stephen Colbert that September, though it quickly rebounded and has remained in first place. In 2016, a New York Times study of the 50 TV shows with the most Facebook Likes found that Tonight "is more popular in cities than in the surrounding countryside". However, beginning in early 2017, The Tonight Show lost total viewership to The Late Show with Stephen Colbert for sixteen consecutive weeks beginning from the week of inauguration of Donald Trump, and also marked the first time that The Late Show with Stephen Colbert became the highest-rated late-night TV show by total viewership. Despite this loss, The Tonight Show led in the 18–49 year old demographic. The Late Show with Stephen Colbert became the highest-rated late-night talk show for the September 2016 to May 2017 season, averaging 3.2 million nightly viewers, beating The Tonight Show. His ratings fall has been ascribed to his pursuit of "broad appeal rather than political criticism" on divisive issues. Much like Fallon's preceding tenure on Late Night, many clips of the show have been made available on YouTube, Facebook, and other services shortly after its television broadcast. Many clips have gone on to become viral videos, which, along with widely viewed videos from competitor Jimmy Kimmel Live!, had an effect on the entire state of late-night television. Media pundits have predicted that future programs' accessibility online will be more important than their television ratings. David Letterman, a thirty-year veteran of the format who was the first host of Late Night and then hosted Late Show on CBS until 2015, partly retired due to his inability to produce viral bits. In February 2015, Ben & Jerry's released a new flavor of ice cream called The Tonight Dough. It consists of caramel and chocolate ice creams topped with chocolate cookie swirls, chocolate chip cookie dough, and peanut butter cookie dough. On October 27, 2015, it was announced that the attraction Twister...Ride it Out at Universal Studios Florida would be closing on November 2, 2015 to make room for Race Through New York Starring Jimmy Fallon, a ride based on Fallon's Tonight Show, which opened on April 6, 2017. In Australia, The Tonight Show premiered on The Comedy Channel on February 18, 2014 – airing the same day as its U.S. broadcast. It also airs on free-to-air network ABC Comedy (as opposed to The Comedy Channel which is a subscription television network) on a two-day delay, premiering on March 24, 2014. On September 21, 2014 The Comedy Channel dropped The Tonight Show, making ABC Comedy the exclusive broadcaster of the show in Australia at the time. Beginning March 2, 2015, the series returned to pay television, this time, however, airing on E! – airing within hours of the American broadcast. In Belgium, the show airs with a delay of several days on Vier at midnight CET every Monday through Friday, and at 11:05 pm CET every Sunday. The show's first broadcast took place on October 12, 2015. In Brazil, the show aired on the subscription channel GNT, debuting in February 24, 2014 under the title The Tonight Show com Jimmy Fallon. GNT broadcasts the show on a three-day delay at 1 am with Portuguese subtitles. The show's broadcast continued until September 2017, when GNT don't reached an agreement with NBC, which doesn't allowed the channel to host the Tonight Show episodes on its on-demand video platform and by the one-week broadcast delay in relation to the United States, with the show's videos reaching the Brazilian public first through YouTube. In Canada, The Tonight Show airs on CTV (CTV Two), broadcasting simultaneously with NBC. In France, the show airs at 6:15pm every Monday to Friday on pay television Canal+. In Germany, the show airs at 11 pm CET the next day every Monday to Friday on One. The show's first broadcast took place on January 25, 2016. It includes German subtitles. In Italy, the show airs Monday through Friday at 10:45pm CET on pay television network FOX the next day from the original NBC broadcast. It started airing on September 19, 2016 . In the Philippines, Jack TV airs the show. In Portugal, The Tonight Show airs on the subscription channel SIC Radical every Monday through Friday at 10 pm. In South Asia (excluding Sri Lanka), The Tonight Show airs on Comedy Central India same day as NBC. In Southeast Asia (including Sri Lanka), The Tonight Show airs on CNBC Asia with back-to-back editions of the show on weekends, and on E! Asia within 12 hours after the U.S. In Sweden, the show airs on TV12 the next day after US broadcast. In the United Kingdom, the show airs a day after broadcast on E! at 10pm local time. An edited-down 30-minute version airs on CNBC Europe at 11 pm GMT, airing on a one-show delay from NBC. A selection of the best episodes are shown on Saturdays and Sundays from 9 pm CET in a 45-minute format. In Hong Kong, the show airs on ViuTVsix from 1 April 2019. ^ Kondolojy, Amanda (August 13, 2015). "NBC Extends 'Tonight Show' Host Jimmy Fallon's Deal through 2021". TV by the Numbers. Retrieved August 15, 2015. ^ a b c d e f g h i j k Kamp, David (February 2014). "Heeeeere's Jimmy!". Vanity Fair. Retrieved February 18, 2014. ^ Pang, Kevin (March 2, 2009). "Jimmy Fallon: Host for a Twittering society". Chicago Tribune. Retrieved June 16, 2012. ^ Sternbergh, Adam (November 7, 2010). "Mr. Sunshine". New York. Retrieved June 16, 2012. ^ a b Collins, Scott (January 9, 2014). "Jimmy Fallon: Johnny Carson would 'be proud' of my Tonight plans". Los Angeles Times. Retrieved February 18, 2014. ^ a b c Carter, Bill (March 20, 2013). "Tonight, With New Host, Set to Reclaim Its New York Roots". The New York Times. Retrieved February 18, 2014. ^ Carter, Bill (April 3, 2013). "Leno Blesses 'Tonight Show' Succession Plan". The New York Times. Retrieved August 15, 2013. ^ De Moraes, Lisa (December 30, 2013). "UPDATE: NBC "Taking Every Precaution" In Wake of Russian Violence Walking Up To Sochi Olympics". Deadline Hollywood. Retrieved February 10, 2014. ^ De Moraes, Lisa (August 9, 2013). "Leno's Last 'Tonight Show' To Air Feb. 6; Staff Paid Until September". Deadline Hollywood. Retrieved August 15, 2013. ^ Poniewozik, James. "The Smartest Thing Jimmy Fallon Did on His First Tonight Show". ^ Andreeva, Nellie; Petski, Denise (March 13, 2019). "NBC Orders Jimmy Fallon's 'That's My Jam' Music & Variety Game Show Inspired By 'Tonight Show' Segments". Deadline. ^ The Tonight Show Starring Jimmy Fallon (2 February 2015). "Jimmy Fallon's "Fresh Prince" Cold Open" – via YouTube. ^ The Tonight Show Starring Jimmy Fallon (16 September 2015). "Donald Trump's Phone Call with Hillary Clinton" – via YouTube. ^ The Tonight Show Starring Jimmy Fallon (3 August 2015). "Obama Calls Donald Trump with Debate Advice" – via YouTube. ^ The Tonight Show Starring Jimmy Fallon (14 October 2015). "Donald Trump & Ben Carson Watch Democratic Debate" – via YouTube. ^ The Tonight Show Starring Jimmy Fallon (5 November 2015). "Jimmy Interviews Bobby Jindal (Aziz Ansari)" – via YouTube. ^ a b "The Tonight Show Starring Jimmy Fallon: The Debating Game". ^ "SNL Wanted Jimmy Fallon to Take Over Trump From Taran Killam". ^ The Tonight Show Starring Jimmy Fallon (19 March 2014). "Obama & Putin Phone Conversation on "Tonight Show"" – via YouTube. ^ The Tonight Show Starring Jimmy Fallon (13 January 2016). "Bob Dylan Sings "Hotline Bling" (Jimmy Fallon)" – via YouTube. ^ a b c d e Carter, Bill (February 16, 2014). "Tonight Show Returns to New York After Nearly 42 Years". The New York Times. Retrieved February 18, 2014. ^ Emery, Debbie (February 17, 2014). "Jimmy Fallon Reveals the 'New Era' of The Tonight Show to Brian Williams (Video)". The Hollywood Reporter. Retrieved February 18, 2014. ^ a b Bond, Paul (May 7, 2013). "NBC Dumps $25 Million Jimmy Fallon NYC 'Tonight Show' Studio". The Hollywood Reporter. Retrieved August 15, 2013. ^ "Craig's New Stage". rsanews.com. April 5, 2012. Retrieved February 22, 2014. ^ Block, Alex Ben (April 24, 2013). "Tonight Shows' NYC Move To Save NBC $20 Million in Tax Credits". The Hollywood Reporter. Retrieved February 15, 2014. ^ "Tickets and NBC Studio Tour". NBC.com. Retrieved October 18, 2014. ^ a b Trust, Gary (February 18, 2014). "U2, Will Smith Rock Jimmy Fallon's First Tonight Show: Minute-By-Minute Live Taping Review". Billboard. Retrieved February 18, 2014. ^ Johnson, Steve (February 18, 2014). "Review: Jimmy Fallon takes over Tonight Show". Chicago Tribune. Retrieved February 18, 2014. ^ a b c d e Stanley, Alessandra (February 18, 2014). "Jimmy Fallon Debuts New Tonight Show in New York". The New York Times. Retrieved February 18, 2014. ^ a b Franich, Darren (February 18, 2014). "The Tonight Show Starring Jimmy Fallon premiere review: No one is more excited than Jimmy". Entertainment Weekly. Retrieved February 18, 2014. ^ Bianco, Robert (February 18, 2014). "Review: Fallon is easy to like in Tonight Show debut". USA Today. Retrieved February 18, 2014. ^ Day, Patrick Kevin (June 11, 2013). "With Jimmy Fallon, The Tonight Show gets back to 'Starring'". Los Angeles Times. Retrieved February 18, 2014. ^ "Bid Farewell to 30 Rock's GE Sign; 'Comcast' Will Top the Tower". Curbed.com. June 18, 2014. Retrieved January 30, 2016. Also, Comcast applied to change all ground-level signage saying "GE Building" to "Comcast Building." ^ Roberts, Sam (June 13, 2014). "Comcast Seeks to Replace G.E. 's Initials at 30 Rock". The New York Times. Retrieved June 13, 2014. ^ Carter, Bill (November 24, 2014). "Jimmy Fallon's Name Goes on 30 Rock Marquee". The New York Times. Retrieved June 5, 2015. ^ Bianculli, David (February 18, 2014). "With Humor And A Nod To History, Fallon Takes Over The Tonight Show". NPR. Retrieved February 18, 2014. ^ a b Hiltbrand, David (February 17, 2014). "New Tonight Show bandleader has show-biz roots". Philadelphia Daily News. Archived from the original on March 1, 2014. Retrieved February 19, 2014. ^ a b Zoglin, Richard (May 14, 2015). "David Letterman Knew How to Talk". The New York Times. Retrieved May 16, 2015. The late-night world that Mr. Letterman leaves behind is almost all performance. Jimmy Fallon has turned the "Tonight Show" into a festival of YouTube-ready comedy bits — lip-syncing contests, slow-jams of the news, musical impressions, games of Pictionary and egg Russian roulette. His interviews, meanwhile, have resurrected the kind of Merv Griffin-style celebrity gush that Mr. Letterman thought he had stamped out years ago. Mr. Fallon is setting the pace for the new, performance-dominated late-night scene. ^ "Seahawks, Packers get 'Superlatives' treatment from Fallon on 'Tonight Show'". SI.com. Retrieved 2018-06-03. ^ "WATCH: Jimmy Fallon dishes out 'Tonight Show' superlatives to Penguins, Predators". CBSSports.com. Retrieved 2018-06-03. ^ "NFL stars mock themselves with 'Tonight Show' superlatives". Detroit Free Press. Retrieved 2018-06-03. ^ Dennis, Andrea (June 16, 2014). "Jimmy Fallon brings 'Tonight Show' to Orlando this week". WESH.com. Retrieved October 13, 2014. ^ "'Tonight Show' Heading To Phoenix For Post-Super Bowl Broadcast". Deadline Hollywood. September 30, 2014. Retrieved October 13, 2014. ^ a b Engel, Neil (12 January 2017). "Your Wild Ride with Jimmy Fallon Begins April 6 - Close Up". Universal Orlando Resort. Retrieved January 23, 2017. ^ Justin, Neal (November 15, 2017). "Jimmy Fallon to host 'Tonight Show' live from Minneapolis after Super Bowl". Minneapolis Star Tribune. Archived from the original on November 15, 2017. Retrieved November 15, 2017. ^ Justin, Neal (January 9, 2018). "Fallon unveils guests for Mpls. Super Bowl show: Timberlake, the Rock, 'This Is Us' cast". Minneapolis Star Tribune. Archived from the original on January 11, 2018. Retrieved January 11, 2018. ^ Elber, Lynn (January 14, 2019). "Jimmy Fallon: Puerto Rican episode a 'love letter' to island". AP News. Retrieved January 23, 2019. ^ Fierberg, Ruthie (January 16, 2019). "Jimmy Fallon Joins Puerto Rico Hamilton for 'The Story of Tonight'". Playbill. Retrieved January 23, 2019. ^ Reed, Ryan (January 16, 2019). "Bad Bunny Plays 'Mia,' Leads Parade in Streets of Puerto Rico on 'Fallon'". Rolling Stone. Retrieved January 23, 2019. ^ Exposito, Suzy (January 16, 2019). "Watch Ozuna and José Feliciano Sing Love Song to Puerto Rico on 'Fallon'". Rolling Stone. Retrieved January 23, 2019. ^ Fierberg, Ruthie (January 16, 2019). "Jimmy Fallon Freaks Out Riding 'Monster' Zip Line in Puerto Rico: 'Get Me Home!' (Video)". TheWrap. Retrieved January 23, 2019. ^ Morabito, Greg (January 16, 2019). "Watch José Andrés and Jimmy Fallon Have a Heartfelt Discussion About Puerto Rico". Eater. Retrieved January 23, 2019. ^ Beresford, Trilby; Schaffstall, Katherine (January 15, 2019). "Jimmy Fallon, Lin-Manuel Miranda Perform 'Hamilton' Songs, Bond With Locals in Puerto Rico". The Hollywood Reporter. Retrieved January 23, 2019. ^ Acevedo, Nicole (December 17, 2018). "Jimmy Fallon will do special 'Tonight Show' in Puerto Rico with Lin-Manuel Miranda, 'Hamilton' cast". NBC News. Retrieved December 20, 2018. ^ Levin, Gary (February 18, 2014). "It's Jimmy Fallon's day on Tonight Show". USA Today. Retrieved February 18, 2014. ^ Poniewozik, James (February 18, 2014). "The Smartest Thing Jimmy Fallon Did on His First Tonight Show". Time. Retrieved February 18, 2014. ^ a b c Walters, John (February 10, 2015). "Fallon Is the King on YouTube but Not on the Night's Talk Shows". Newsweek. Retrieved July 15, 2015. ^ a b c Silman, Anna (December 22, 2014). "From the Emma Stone lip-sync to "House of Cue Cards": The year in Jimmy Fallon". Salon. Retrieved July 15, 2015. ^ McSpadden, Kevin (February 5, 2015). "Watch a Glorious Saved by the Bell Reunion Courtesy of Jimmy Fallon". Time. Retrieved February 20, 2015. ^ Hare, Breeanna (January 7, 2015). "Jimmy Fallon could've dated Nicole Kidman … if he hadn't blown it". CNN. Retrieved July 15, 2015. ^ "Jimmy Fallon Receives Backlash After Donald Trump Interview". PEOPLE.com. 2016-09-16. Retrieved 2017-02-01. ^ Nadkarni, Rohan (2016-09-16). "Jimmy Fallon Was Always Going to (Continue to) Enable Donald Trump". GQ. Retrieved 2017-02-01. ^ "Samantha Bee Slams Fallon on Trump as Fallon Responds to the Controversy". pastemagazine.com. Retrieved 2017-02-01. ^ "Jimmy Fallon has commented on the reaction to his controversial Donald Trump interview". The Independent. 2016-09-20. Retrieved 2017-02-01. ^ Itzkoff, Dave. "Jimmy Fallon Was on Top of the World. Then Came Trump". Retrieved 2017-05-18. ^ Goodman, Tim (February 17, 2014). "Jimmy Fallon: A Strong First Tonight Show Belies the Long Wait Ahead For Late Night Dominance". The Hollywood Reporter. Retrieved February 18, 2014. ^ Lowry, Brian (February 18, 2014). "TV Review: The Tonight Show Starring Jimmy Fallon". Variety. Retrieved February 18, 2014. ^ a b "This Week's Cover: EW's Best and Worst of 2014, starring Entertainer of the Year Jimmy Fallon". Entertainment Weekly. December 3, 2014. Retrieved February 5, 2015. ^ a b Itzkoff, Dave (May 10, 2015). "As Letterman Moves On, Late-Night Success Is Unmoored From TV". The New York Times. Retrieved July 15, 2015. ^ Sheffield, Rob (May 20, 2015). "Goodbye Letterman, Hello Fallon: The Nicening of Late Night". Rolling Stone. Retrieved July 15, 2015. ^ Kissell, Rick (February 18, 2014). "Jimmy Fallon's Debut as Tonight Show Host Draws 11.3 Million Viewers". Variety. Retrieved February 18, 2014. ^ Andreeva, Nellie (February 22, 2014). "Jimmy Fallon's Debut Delivers 'Tonight Show's Most Watched Week In 20 Years". Deadline Hollywood. Retrieved February 22, 2014. ^ a b Kissell, Rick (February 5, 2015). "Late Night Ratings: NBC's 'Tonight' Surges in L.A. Return". Variety. Retrieved February 5, 2015. ^ O'Connell, Michael (June 5, 2014). "Four Months Into Jimmy Fallon's 'Tonight,' Late Night Flourishes". The Hollywood Reporter. Retrieved February 5, 2015. ^ O'Connell, Michael (September 9, 2015). "TV Ratings: Stephen Colbert Tops Late Night With Strong 'Late Show' Debut". The Hollywood Reporter. Retrieved September 21, 2015. ^ O'Connell, Michael (September 16, 2015). "Jimmy Fallon Fends Off Stephen Colbert in First Round of Late-Night Ratings Battle". The Hollywood Reporter. Retrieved September 21, 2015. ^ "TV Ratings: Stephen Colbert's Winning Streak Hits 16 Weeks". ^ "TV Ratings: Stephen Colbert's Wins Late Night TV Season". ^ A.V. (31 October 2017). "Who can fill the role of Tom Lehrer today?". The Economist. ^ a b c "The Tonight Show Starring Jimmy Fallon". Academy of Television Arts & Sciences. Retrieved September 12, 2015. ^ "The Tonight Show Starring Jimmy Fallon Digital Experience". Academy of Television Arts & Sciences. Retrieved September 12, 2015. ^ Bort, Ryan (August 12, 2014). "Why Jimmy Fallon Is Changing Late Night for the Better". Esquire. Retrieved July 15, 2015. ^ Nededog, Jethro (May 7, 2015). "David Letterman says viral videos by Jimmy Kimmel and Jimmy Fallon drove him out of late-night TV". Business Insider. Retrieved July 15, 2015. ^ Atkins, Hunter (February 18, 2015). "Ben And Jerry's Releases Jimmy Fallon 'The Tonight Dough' Flavor". Forbes. Retrieved November 8, 2018. ^ Surrel, Jason (October 27, 2015). "Jimmy Fallon to Get His Own Ride at Universal Orlando Resort in 2017". Universal Orlando Resort. Retrieved October 28, 2015. ^ Knox, David (January 30, 2014). "Aidate: The Tonight Show Starring Jimmy Fallon". TV Tonight. Retrieved January 30, 2014. ^ Knox, David (March 18, 2014). "ABC2 To screen The Tonight Show Starring Jimmy Fallon". TV Tonight. Retrieved May 18, 2014. ^ Knox, David (September 22, 2014). "Comedy Channel drops Jimmy Fallon". TV Tonight. Retrieved September 23, 2014. ^ Knox, David (February 24, 2015). "E! to fast-track Jimmy Fallon". TV Tonight. Retrieved February 27, 2015. ^ "De grootste sterren bij Jimmy Fallon". www.vier.be. Retrieved October 15, 2015. ^ "'The Tonight Show com Jimmy Fallon' será exibido no Brasil a partir de hoje" (in Portuguese). Folha de S.Paulo. February 24, 2014. Retrieved August 12, 2016. ^ "Programa 'Tonight Show com Jimmy Fallon' estreia no GNT" (in Portuguese). GNT. July 6, 2014. Retrieved August 12, 2016. ^ "Programa de TV com Obama e Madonna será transmitido pelo GNT neste domingo" (in Portuguese). Zero Hora. July 10, 2016. Retrieved August 12, 2016. ^ Cristina Padiglione (April 29, 2016). "GNT exibe a aula de Gisele a Jimmy Fallon" (in Portuguese). O Estado de S. Paulo. Retrieved August 12, 2016. ^ Cristina Padglione (10 January 2018). "Sem acordo com NBC, GNT deixa de exibir o talk show de Jimmy Fallon". Telepadi (in Portuguese). Folha de S.Paulo. Retrieved 11 January 2018. ^ "The Tonight Show Starring Jimmy Fallon on CTV 2". CTV.ca. Retrieved February 17, 2014. ^ "TV Schedule - OSN.com". Retrieved February 16, 2016. ^ "The Tonight Show-CANALPLUS.FR". Retrieved February 16, 2016. ^ "The Tonight Show Starring Jimmy Fallon | Einsfestival". Einsfestival. Retrieved January 29, 2016. ^ Poli, Chiara (September 5, 2016). "The Tonight Show con Jimmy Fallon: dal 19 settembre su FOX". MONDOFOX. Archived from the original on September 20, 2016. ^ "What you'll find on the new 'City Television' channel". Rappler.com. April 8, 2015. Retrieved August 12, 2016. ^ "The Tonight Show Starring Jimmy Fallon". CT. Solar Entertainment Corporation. Retrieved August 12, 2016. ^ "The Tonight Show With Jimmy Fallon". SIC Radical (in Portuguese). SAPO. Retrieved August 12, 2016. ^ "Comedy Central lines up four new shows". bestmediainfo.com. ^ "Asia-Pacific TV schedules". Retrieved January 30, 2016. ^ "Hillary Clinton är premiärgäst hos Jimmy Fallon i TV12 på tisdag". ^ "CNBC TV Europe: The Tonight Show Starring Jimmy Fallon". CNBC.com. Archived from the original on August 19, 2015. Retrieved August 19, 2015.